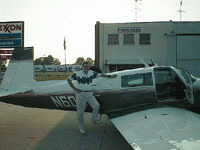 Here are some pictures of the first, transcontinental part of the trip - from Frederick, Maryland to Oakland, California. 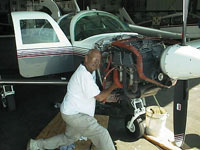 Once in California, ferry tanks (extra gas tanks) were installed inside the plane, along with a manually operated cockpit oil pump system that allowed me to add oil to the engine while in flight. 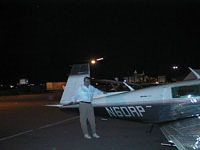 Departing from Frederick Aviation in Frederick, MD. A thunderstorm viewed from 12,000 feet over Arizona. Weather avoidance in clear air like this is easy, but when in the clouds or at night the plane's onboard Radar is needed detect the rain from a thunderstorm and the "Stormscope" detects and plots the location of lightning strikes. Between these two pieces of equipment, a pilot is able to circumnavigate thunderstorms. 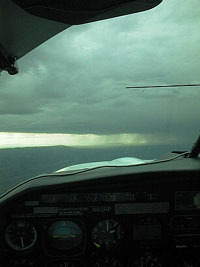 The dark streaks on the right are rain shafts from the storm, the light area on the left is where the plane is pointed. I know you won't believe this, but I stopped here in Las Vegas just for gas and a night's sleep - really! 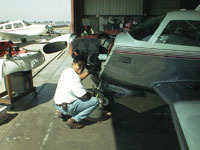 The airplane getting its first oil change of the trip at Leahy Aviation in Hayward, CA.